If you want to do a little DIY house painting inside or outside of your private residence, you should know that discovering the best house painting tips and hacks will help you to do a better job in less time. Since you’re going to be spending money on paint and other painting supplies, from turpentine to brushes to rollers to rags and beyond, as well as investing your own time via “sweat equity”, learning some great ways to get better results will help you to access a truly superlative return on your investment. Without further ado, let’s talk about some interior and exterior house painting tips which really deliver for “do-it-yourselfers”! A lot of people purchase paint rollers which aren’t exactly top of the line. Of course, they do this in order to economise. If you’ve bought rollers which are fairly cheap, you should know that tweaking them before you use them will help you to get a smooth, professional finish. With this in mind, we recommend the simplest hack ever…just use a lint brush on the roller or rollers in order to remove any fuzzy bits from them. This easy trick will get rid of any fuzz which might cause imperfections while you’re painting. Cleaning up paint trays can be tough and time-consuming. 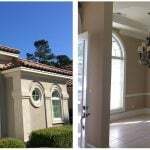 There’s just no reason to labor over this sort of task and you may avoid it with a tip that will work for interior or exterior house painting jobs. Just line a paint tray with plastic before you pour in the paint. When you’re ready to clean up, remove the plastic liner and throw the whole mess away. It’s sort of like lining a pan in foil before roasting something in the oven and you surely already know how this facilitates clean-up, versus scrubbing caked-on food off of a pan. This painting hack means that your paint trays will always stay clean, or almost clean. Use old plastic bags – just make sure that they are large enough to cover the whole trays, with some plastic left over on the sides. This will make it easier to pull the whole mess away once you’re done for the day or night. The right preparation really works wonders, so be sure to clean interior or exterior surfaces carefully before you begin painting. If you’re inside, use a wet Swiffer to get the job done. Outside, a pressure hose may be the best option. Also, you should know that some people use a vinegar hack after they clean and dry surfaces. They find that a thin coat of vinegar, applied to a surface, such as a wall, helps to prevent paint cracking. If you want to ensure a nice, smooth finish, as well as long-lasting beauty, combining these two painting tricks will be smart. You may kill two birds with one stone by cleaning surfaces with a vinegar and water solution! It will lift grease and other debris away. Vaseline is pretty cheap and you get a lot for a very fair price. This is good news, as smart DIY pros smear a little of this clear petroleum jelly on components, such as screws, which they don’t want painted. The Vaseline creates a protective barrier, so you can do your painting, without worrying about painting things that aren’t meant to get a coat of paint. Just wipe the Vaseline off once you’re done. Now that you know some clever and quick interior and exterior house painting tips, you’ll be ready to get better results in no time flat.